I want to write about Forex trading without look at the chart price! Maybe you become confuse and the first question will become is how we can trade in forex market without looking at the prices! In 2006 I try to analyze the market’s movement times and open/close the orders according to the time not the Forex market prices or analyze the Forex charts. After the analyze a few Forex currencies pair like EURUSD GBPUSD USDJPY and GBPJPY I found good way to earn little profit with low risk by just analyze the Forex market action time. But how you can analyze the Forex market by time and how you can earn profit. 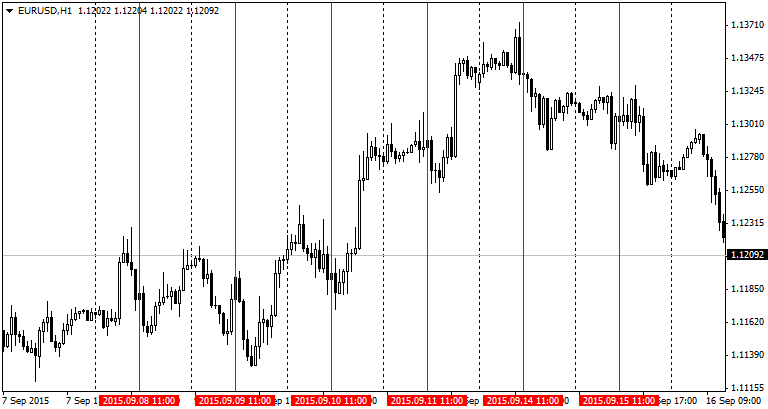 As you can see I draw vertical line on time 11:00 on EURUSD just look at the chart and think that if you send buy stop and sell stop on the market without any Forex chart analysis on the time 11:00 with specify distance what will happened ? The time 11:00 on EURUSD in the most days was the start time for trend this is not important that the trend is up or down we want follow the trend by sending buy stop and sell stop on the chart. This strategy is one of my favorite Forex trading strategies. To analyze the time you can focus on M1 chart and find the best time to send your buy stop and sell stop orders you don’t need to know the market trend you just know that on that time the market will start movement. To understand the best distance for your buy stop and sell stop orders you should check the chart on M1 and analyze it. To understand this I will show some example by the picture. I just write the main strategy features you can mix this Forex strategy with other strategy to open a good position or send the order on the best price. For example you can use Bollinger Bands to get the best price for sell stop or buy stop orders and etc. The best Forex currency symbols for trading according to the time strategy is GBPUSD according to my Forex trading experience too. Some Forex symbols have more than one time to put orders. On daily trend might you can find 2 even more times to send your best orders. I earned about 100% profit in 10 months by just send buy stop and sell stop on GBPUSD Without any analyze! Have a Good Forex Trading.